Okay, so this was a nice interlude before painting up another battalion of infantry. It is a very nice set; both the vivandiere figure and the donkey are cleanly sculpted and details are easily made out. I highly recommend this set to anyone interested in livening up a Napoleonic battlefield. I have no idea what the veggies are supposed to be, but I kept thinking broccoli and celery. Here they are next to a Perry figure for comparison. I'm hoping the Old Glory British Light Infantry I picked up off a fellow TMPer arrive this week. I'm also waiting on a box of the newly released Perry British Hussars. Once they are both painted, another Black Powder game will soon follow. While awaiting the arrival of some Old Glory British Light Infantry, figured I'd knock out the Warlord Vivandiere that was ordered a while back. Still need to finish the burro. It's a nice model, and I hope to get the nice Eureka model also. She will be useful in Sharp Practice games. The model comes with two choices of heads and right arms. The other hat has a rounded top, and the other arm wields a pistol. Here's a link to a nice blog entry of vivandiere reenactors. Here are the Perry 9 and 6 pounders based. Old Glory limbers and Perry Guns w/crews. The guns need to be based along with their respective crews. This is a pretty good set - as it comes with two limbers with not only drivers, but gunners seated upon the limbers. The Old Glory French limber set only comes with drivers. And the Perry guns with crews. I've been reading the Osprey Salamanca book that I just won off of ebay. Really good read with nice illustrations. Plan to play out a portion of the battle the next time we play Black Powder. Happy Holidays all! Here's the current progress on the crews - Perry gun crews in the front and the OG guys in the back. I love the animated facial expressions of the OG guys. The jackets haven't been highlighted yet; nor have the red facings been added. The limbers and horses have been mounted - here they are with the Perry guns - a 9 and 6 pounder. I ran out of acrylic caulking and tried using some spackle I had in the garage. Acrylic caulking is better for adhesion of figures; I ended up using some white glue to hold some of the horses down. Started on an Old Glory limber set, as well as two Perry guns - one each 6 and 9 pounder. Here are the horses, limber and gun carriages with basic block painting prior to a Minwax stain. And the pieces after the stain - along with the guns added to the carriages.The gun and limber crews are next. Okay, so all of the Victrix, Perry and OG 2nd Ed. guys have been based or rebased as the case may be for the earlier washer-based figures. There are six French battalions, of which five are 24-man, and one 36-man. The British are currently at five battalions, four 24-man, and one 32-man - the Guards battalion. Thanks to another TMP buy, I'm waiting on the arrival of a pack of Old Glory (1st Ed.) British Light Infantry. These are planned to be painted as 71st Highland Light Infantry. So, in the end there will be six infantry battalions each for the French and British. Enough to flesh out two or three brigades per side. Next on the painting schedule are some Perry British RHA and Perry French Dragoons - the left overs from the ones I painted earlier for my buddy. I hope to play the next Black Powder game based upon the Battle of Salamanca. This battle had the British and French forces pretty evenly matched; the British victory earning Wellington the reputation of an offensive general as well. As far as the OG 2nd Ed. French go, I'd say the 1815 (& likely the 1812) guys are a decent match for Perry French in both style, uniform and size. The Perry are a bit more robust, but not so bad to look out of place - possibly even in the same units. (ERRATA: The OG bayonets are a little thicker than both the Perry & Victrix ones.) The 1809 OG 2nd Ed. French are a little smaller - even compared to the 1815 guys. Mainly they are little shorter; however, if you add some height to their base, as I did with plasticard, they look okay in their own units. The Victrix French, as well as their Highlanders are taller and larger overall than both Perry and of course the OG guys. In fact, the Victrix French and Highlanders are larger than even their own British regular infantry sets. Anyway, they all are not so bad to look out of place on the table next to each other. Especially when the cannons roar and the smoke fills the air. Finished the remainder of the OG 2nd Ed. French - painted as 4th Swiss Infantry. I read that the red took on a violet shade in sunlight. I mixed a little bit of blue into the red for the base coat to give it a slightly darker look than the British red coats. Here are some surviving examples of Swiss infantry coats - the two on the left are from the late 18th Century; the two on the right are from the Valaison Battalion. 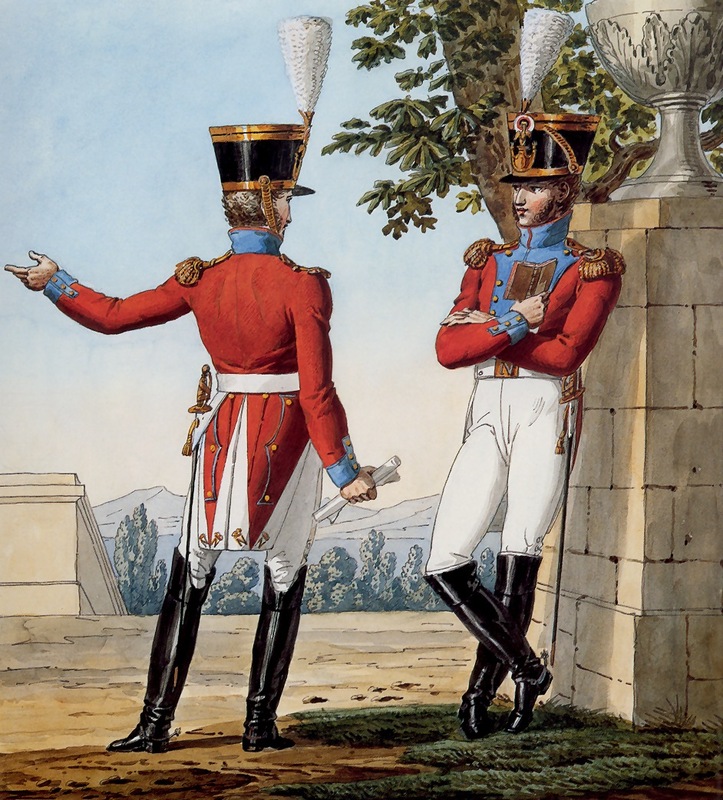 A period illustration of 4th Swiss Regiment officers - in 1812 Bardin regulation uniforms. Thanks to Kevin Smyth and crew, another great game day was held at the Boeing Museum of Flight. As always, the games are held under the SR-71 Blackbird. This year, I finally played a Wings of War game - hosted by Lloyd B. He really made the game easy to understand and accommodated players of all ages and experience (or lack thereof as in my case). I really liked the rules and love the pre-painted aircraft. Actually I've always admired the models, but didn't want to get them if I didn't like the rules - I guess I'll be getting a couple soon. There were three or four games in the morning period, Wings of War being one of them. Here are a couple of the other morning games. There were several DBA games going on also. In the afternoon, I got into Bruce M.'s Robot Gladiatorial game - this was another fun game and the first time I played a set of gladiator rules. Bruce's rules are always geared for fast-play and no sitting around being bored. However, that said, most of the players, myself included, kept rolling incredibly bad and the fighting was a bit more prolonged than he had intended. All in all, another great time and what a great venue. Kevin being an educator gets us in with free passes as it is Educators Day. Due to low-lighting in most of the aircraft display areas, I didn't take any pictures of the awesome number of WWI and WWII aircraft. However, I did want a picture of this model of a German airship. It looked just too cool - sort of VSFish. Here's link to Dave S's blog with more photos of the event - including closeups of the Axis & Allies WW2 air game - and a nice review of the game.﻿ Sounds like something else I will pick up. Just need to base them, but they are done with painting. The last OG 2nd Ed. unit will be a mix of the left overs from the 1809 & 1815 packs. Enough for a 24-man unit which I think I'll paint as Swiss 4th Regiment with red coats and light blue facings. The flag for this unit is a spare that came with the Perry box. NOTE: I see now that I forgot to paint the tops of the officers' boots - will take care of that before they get based. Hot on the heels of the 1809 guys, here are their 1815 brethren so far. As you can see, they're wearing the 1812 "Bardin Regulation" coats with closed lapels. The painting sequence: 1) Flesh with a wash; 2) Metallic buttons, shako plates and chin scales, etc. ; 3) Red piping and collar (Voltigeurs yellow collar w/red piping), Grenadier and Voltigeur shako bands and epaulletes; 4) White piping - cuffs and collar, lapels, turnbacks and straps. This time the strip of cloth at the cuffs beneath the buttons were painted blue before painting the buttons. It's really hard to tell if it's dark blue or black anyway - being confined to such a small space once the red & white piping are added. This is how they looked with the metallic parts, red piping and elite company colors painted. Next, the red cuffs and blue coat will be painted - which avoiding the areas already painted and allowing for "blacklining" will not be too much to do. Just need to finish the drummer - after I find a nice uniform. Thanks to the generous amount of flags Victrix supplies, this unit will have the one for the 2nd Line. Here they are less the command group, based on 40X40mm Litko plywood bases. Using some creative basing to raise their height a bit, they look okay next to the Perry guys on the far left in the photo. Victrix are a bit larger all around, but since they'll be in separate units, they should be fine. Napoleonics have a lot of details to paint on the back of figures too - it's like painting twice as many Ancient figures. Once I finish the other two OG units I'll finish painting & flocking all the bases - including the earlier ones with Victrix and Perry figs. ADDENDUM: Painted the drummer with light blue coat and yellow facings - this combination was used for at least the 42nd Line. Your faithful host posting another WIP on these nice OG 2nd Ed. Napoleonics. Continuing with Doug Hamm's method of a reverse sort of painting. The order being the piping (both red & white), cuffs and color, lapels, small clothes, breeches, shako cords, and blue coat proper. The metal buttons were painted earlier. Oh, I painted the Grenadiers' plumes and epaulettes too as I didn't want to waste any of the red I had in the palette. I'm still deciding on the drummer's colors. Interestingly, very little time was spent with the blue, as there isn't very much of the blue cloth showing. Full disclosure: the strip below the cuff buttons are still black - I couldn't fit my brush in between the buttons to add blue - maybe I'll paint that little strip blue on the next batch of French. Here is how they looked with the the red areas painted - that is, the piping, collars and cuffs. The ones in the back have the base dark blue added to the coats. White was added to the blue for highlights. Here is how the looked with the white added - cuff and color piping, straps, lapels, turnbacks, small clothes and breeches. I'll soften the folds of the breeches with a gray. Just a quick WIP update. Using a method picked up from Doug Hamm (Larry Leadhead's alter ego), the buttons and other metallic parts have been painted before the coat itself. Next will be the piping and cuffs, collars and lapels. This is a reverse order of the usual way most people paint - myself included. However, it works well with Napoleonics as it allows for areas of the black undercoat to remain - in effect already having areas blacklined. Thanks to a generous TMPer, I managed to pick up about 60 of these ships for less than .50 cents each, including shipping. These should be more than enough for future Roman Seas games. Half will be painted with blue markings and the other half in red. I hadn't really heard of C in C before, and after reviewing their site, I saw that these ships are now out of productions (no images). I bought these sight on seen, since their other products, like WW2 aircraft look great. I was pleasantly surprised when I saw them today for the first time. They seem like a good match in size with the Langton and Valiant ships I previously acquired - the painted examples in the photo. I'll start on them after the Old Glory French - which are just primed at the moment.